i've got the loveliest flowering plant growing in my rental property's raised garden bed, but only surviving at one end - the other 2/3 of its length is dead or dying..
i'd like to identify it so that i can see if there's a chance i can salvage the dying 2/3, or, to get the flourishing 1/3 to "spread" along the whole bed length. i've attached a pic, you can see it's in pink flower (it's late winter/spring now) in clumps, dark green glossy ivy-shaped leaves, and appears to be growing along multiple runners..
geranium or pelagonium (I can never tell the difference), probably brought out on a ship in 1946 by a war bride and carefully nurtured on deck in a pot for 6 weeks. I have some of those geraniums, exactly the same, in my garden that were indeed brought out on a ship in 1946, carfully nursed in a pot for 6 weeks, by a war bride who became the wife of the manager of Cadbury chocolate factory (cue willy wonka) who lvied in this house for 50 years. So now all geraniums for me are war bride flowers. PS jbie - those things are the absolute best for taking cuttings, dipping in some rooting gel, setting into a moist pot, and watching them take off. You can take lots of strkings and create a thriving monster again. That is an Ivy Geranium (Trailing Pelargonium). Take some cuttings. They grow so easily from them. wow, thanks! i'll go read up on propagation..
though, i would like to rejuvenate that raised bed by late spring, it's a bit unsightly right now, all dead/dying leaves and runners.. i don't suppose the cuttings will strike up to any purpose by then? They're also nice in hanging baskets and window boxes because of the trailing habit. Def one of the easiest to grow and I love the colour. I don't have that colour, but I do have a couple of baskets LIke many other plants, take cuttings and tip prune to keep the flowers coming and the plants in check. you could cut it back quite hard and dig in compost and water with fish emulsion. They grow pretty quickly. Don't take a cutting from a plant that has taken over a vacant block just because it's free. Cut mine back 2 weekends ago, and left next to a sunny wall. They are shooting already. They will climb up the railings on the verandah. Mine survive because I have them in pots, next to a hot wall. Also, I keep them dry in winter - hardly water them at all. Not surprised it doesnt grow again! 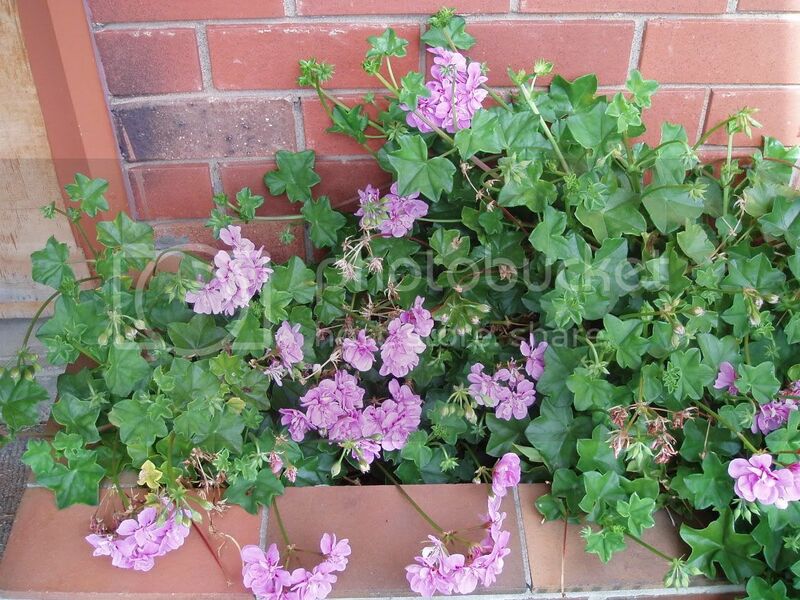 Ellengray, I absolutely MUST have a piece of your historical ivy geranium, PLEASE????? I can't offer my firstborn, but there must be something? Under the cat is the only place that doesn't freeze.... Actually, the cat sleeps on a chair, and the geranium hides under the overlap of the cushion, so the cat smells good and the plant stays unfrozen. And why can't you offer your firstborn? What's your excuse? Come to think of it, it is probably a good thing, cos ellengray would have no time to look after anyone else while she is establishing her garden! I felt the same about wanting some historical geranium...isn't it a lovely story? Cordelia, it truly is a lovely story! As for the firstborn, she was a 'teenager' for about 3 weeks and has been a thorough joy for the rest of her life - I've become quite attached!! And besides, she's cold-blooded and would suffer terribly in Tasmanian winters!